Musial finished his career with 3630 hits, and he had exactly 1815 hits at home and 1815 hits on the road, which proves his overall clutch performance. And Musial’s last hit in 1963 went by a rookie second baseman named Pete Rose, who eventually broke Musial’s National League hits record and then went on to break Ty Cobb’s all-time hits record. Baseball card collectors also know another unique fact about Musial. 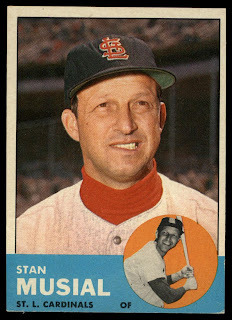 From 1954 through 1957, there were no Stan Musial baseball cards available because he would not sign a contract with Topps. 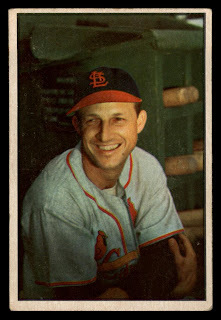 Musial previously had a contract with Bowman and there were Musial cards available before 1954. There is a famous story about the owner of the St. Louis Cardinals, Gussie Busch, approaching Sy Berger from Topps for a contribution to a charity, which finally resulted in Musial’s cards becoming available again. Berger said he would make the donation if Busch could get Musial to sign a contract with Topps. 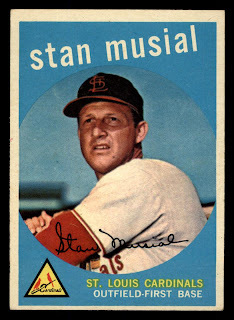 So in the last baseball card series of 1958, a special Stan Musial All Star card became available. 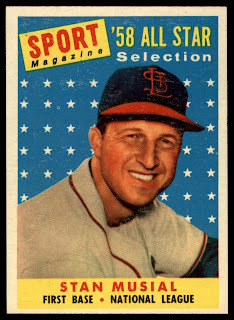 And in 1959, Musial’s card became available in the Topps set. baseball card available at Dean's Cards. Musial was 43 years old when he played his last game for the Cardinals. He became a beloved fixture in the St. Louis community, often showing up at events to play his harmonica. He also learned a trick from his pal, John Wayne, about dealing with the constant autograph seekers. Wayne told Musial how he carried around autographed photos of himself to pass out to those who asked for an autograph – so Musial started doing the same thing! With Stan Musial's passing, baseball has lost one of its true icons from the game’s glory days. Who is your favorite baseball player from the 1950s?